Villa Vistafuerte is a beautifully furnished private villa that offers luxurious accommodation. Located a short distance from the centre of Playa Blanca, this property has it all - quality AND location. The villa comprises a master bedroom with double bed and ensuite. 2 further twin bedded rooms share a second bathroom. The large living area has ample seating with plenty entertainment including flat screen TV, with International channels, DVD player, loudspeakers for Ipod/Mp3 etc, books and magazines. Located off the lounge is the unique dining area. This circular room and has seating for 8 people. The fully fitted kitchen is well equipped for self catering and has all the usual facilities including microwave, electric kettle, toaster fridge / freezer and dishwasher. In the utility area there is a washing machine for client use. The french doors lead out to a private pool area with 6 sunbeds, wooden table and chairs and a large brick-built BBQ. We shared the house with two friends and found that it was perfectly laid out to accommodate two couples. The beds were very comfortable and everything worked as it should. The interior of the house is well laid and nicely furnished but the real treat is the outside space. The pool is a good size and heated. There are plenty of places to either enjoy the sun or shelter from it. The garden is in the sun the whole day. We had bananas to pick directly off the tree (palm) and at other times of the year you could be picking figs or grapes. The barbecue is very good but the charcoal from the local Spar is rubbish unless you like barbecuing on dust. We found the Superdino near the bus station to be the best stocked supermarket although the parking is a bit of a challenge. They have a good supply of things to barbecue and stuff to drink while you are doing it. The villa is conveniently situated for restaurants and bars and small supermarkets for bread and milk. Flamingo beach is very sheltered and pleasant. The cleaners were very efficient and the place was very clean and well kept. All in all a brilliant package. Thank you very much for your nice comments about your recent holidays and for the top rating! We are delighted to read that for you Vistafuerte is the perfect villa. We endeavour to do our utmost to make our guests feel comfortable so we are very glad to learn that we have successed in satisfying our guests on this occasion. It really does make it all worthwhile for all the team when we get such positive comments. Good reviews are the best way to establish trust and build up credibility in future guests so we really appreciate the time you took to write this review. It has been a great pleasure for us hosting you, wife and friends in our villa and we hope we will see you back again in the very near future. Very disappointing, while photos look good, reality is quite different! My mother, sister and I booked a two week stay in this villa (semi detached property). The owner Teresa said she would not meet us until the following morning, so we let ourselves in and immediately were met with a cold damp musty smell. We were unable to work the wifi or tv as there were no instructions of any kind. After one hour of trying to sort out the TV (I later found out there were only 3 English speaking channels) I rang Teresa to ask her how it all worked and that the villa was very cold. She arrived one hour later with an electric heater. I asked where the best supermarket was and she said the name was in the information sheet and I could look it up on Google. She had no time to say where it was or that it had a car park under it. This would have taken maybe 30 seconds to explain and been of a great help to us had she taken the trouble to inform us of this very basic information. My sister and I were in the two bedrooms with the single beds, and neither of us slept, and in fact we had hip and back pains from the discomfort of sleeping on such hard mattresses with wires clearly visible. I phoned Teresa about this and she kindly replaced the two mattresses three days later. We had 4 nights of these dreadful beds. The main problem with this villa was the very loud traffic noise from the main dual carriage way which the property is on, which meant we were unable to use the garden in comfort. Additionally the noise from the other half of the semidetached house at night. Another neighbour, who in our second week, had the builders in with their electric drills, saws, grinders and hammers all day long! We had no respite from the unbearable noise! When I mentioned the smell from the bathrooms and kitchen, Teresa said we could move out if we were not happy! Well, as bad as it was, I did not want to put my 87 year old mother through the turmoil of moving during what was supposed to be a restful holiday in the sun. As she wears hearing aids in the daytime, the noise did not effect her at night and we decided the best way to tackle the noise problem was to spend our days out of the villa. At night we had the choice to either keep the windows closed to reduce the noise or to have them open for fresh air, a difficult choice we should not have had to make. The 1.1 meter deep pool was not warm enough to take a dip in, don't know if you could actually swim in it being so shallow. We are seasoned travellers and can not recommend this property! To say I was very disappointed to read this review is an understatement. To share your opinion with other guests is always appreciated. To tell total untruths is not. It is damaging to a business. But Holiday-rentals gives me the chance to reply. We had a meeting on Friday morning and you had my phone if you might need anything. You called me onThursday at 8.35 pm telling me that wifi didn't work and it was very cold. There were two electric heaters in the house but you wanted another. It took me 35 m. to arrive as I live 35 km from there.The wifi was working. You didn't know how to watch your netflix. That was the problem! Information for your holiday, inc. supermarkets (name, situation, address, timetable, distance) and wifi were in the information sheet.I spent 1 hour explaining everything to you. You phoned me on Friday at 9.15 am grumbling about the hardness of the mattress . New softer mattress were bought and in the meantime you were using the mattress toppers we had onsite. On Saturday night you called me telling that all the bulbs in the main bedroom went out. We went there and it was untruth. That'd be the straw that breaks the camel’s back and I suggested you to leave I would refund your money and you could enjoy the 11 days still left in another place... but obviously you wanted to be my guests! NONE of them were done !!! You checked out leaving it with an absolute filthy cooking smell ! You did not open any window in your whole stay ! You did not cover the pool ! You took the set of keys including the safe one ! You did not want to open windows during the day but did you really want to sleep with windows open with 14-15ºC at nights? 3 electric heaters on... wasn't it very cold ? It amazes me that after my offer of refunding your money you would continue to be in my house 11 days more without being able to enjoy the house neither inside nor outside. It must have been pure torture to have to endure such an experience. All our guests in general, enjoy their stay with us. You have been the ONLY exception. It has been a nightmare hosting you! I would suggest that you maybe holiday at home, It seems you would not enjoy either there! So pretty much at a loss to know what to suggest! I stayed at Villa Vistafuerte for a week with family. 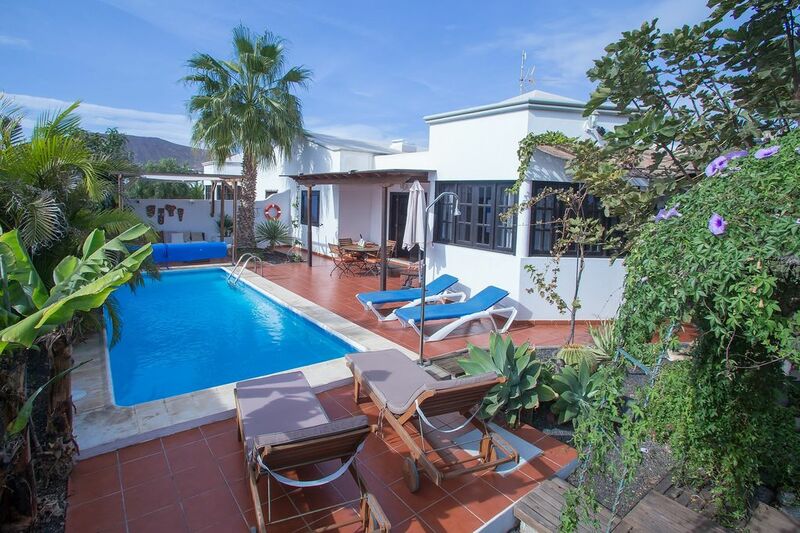 This is a great little villa situated just outside Playa Blanca main town. A cab cost 4 euros so no big issues there either. Lovely pool area, everything maintained well and met with Teresa who was also lovely. Hope to stay again in the future. Recommended. My family and I (2 adults, 3 childen - 8, 8 and 5) mhave just returned froma sunny week in Lanzarote. The villa was just as we expected. A little tricky to find in the dark whilst driving a hire car when you're tired, but we found it all the same. The property was neat, tidy and clean. Maybe more than 1 toilet roll in each bathroom...? Pool towels would have been nice. The description suggests towels included so we left pool towels at home which was an error! Were any of the above deal breakers....? NO. We stilll had a great week. The pool was great, beach an easy walk, Teresa helpful, super markets near by and plenty of resaurants and bars. First of all, I would like to take this opportunity to thank you for writing your review. We are delighted to get feedback from our clients. And we take any comments you have on board, as we always strive to improve our product and service. Thank you very much for all your suggestions and please accept my apologies regarding the description which suggests that pool towels are included I will correct the description to avoid any missunderstanding. It is a pity you did not mention it during your stay as I have some pool towels at home and I would be very pleased to bring them to you..
We would like to thank you once again for taking the time to write this review. And we do hope to see you back again in the not too distant future. The Villa was incredibly clean and very well maintained, the outside area was amazing!!! Lots of seating and loungers and very pretty. Pool was a good size! Villa was very well located to Playa Blanca, around a 10 min walk to the main town, and a 5 min walk to Flamingo Beach, which is a lovely sheltered beach. Teresa welcomed us with a basket full of fruit, food and other essentials such as milk, bread, jam, butter etc, which was really thoughtful, she was very helpful and infact let us stay late on our day of departure as there was nobody coming into the Villa the next day, which was really kind. In the room there was a flat screen TV and a docking station for music which was a very good idea. We will hopefully be returning again soon! Take me back now! Only downside was there was some traffic noise when in the garden but overall everything else more than compensated for this, and garden was very private and not overlooked at all! Other areas to visit were El Golfo, very beautiful and restaurants right on the sea and there was great fish! Marina Rubicon is definitely worth a visit- very pretty, with restaurants and shops, takes around 1 hour to walk from the Villa along a board walk which runs the whole length of Playa Blanca- lovely walk! Timanfaya National Park and volcano worth a visit too- go early or late afternoon. We are very proud to read it, and we are delighted you enjoyed your time in the villa so much. We look forward to seeing you back with us again soon. In the meantime, just keep telling all your friends and family about us! Playa Blanca is the most southerly resort on Lanzarote and has many advantages for those who are looking for sun, sea and sand. From Playa Blanca'seafront you can see acrross to Fuerteventura, which is a mere 11 Km. by ferry. Ferries cross to the island several times a day from the main harbour. The front is populated with a variety of beaches, notably Playa Dorada, Papagayo and Playa Flamingo. Playa Blanca has a relaxed atmosphere and restaurant on the front feature a wonderful sea view. Rental prices based on 4 sharing. Plus 105 euros / week per additional person. Early booking promotion and reductions for stay over 2 weeks. A non-refundable deposit is required at the time of the booking. Check out time: 10.00 am ; Check in time: 16.00 p.m.; When possible check out time later in the evening and Check in time earlier in the morning.